Are there times when you saw/read/heard a dish that makes you crave for it so much that you’re just dying to whip it up right then and now but you can’t because you don’t have the ingredients at hand and can only get them tomorrow? And you know that you have to make them tomorrow otherwise the world would probably die on you (okay that’s exaggerating). Will you then be dreaming about it all night long, making a plan as to what time to wake up to get the ingredients, what time to start baking/cooking, what time to start taking the photos and what time to eat them? Will you read the recipe over and over again until you can almost regurgitate it? That’s what I will do. Or rather, that’s what I normally do, especially when I found recipes involving my favourite food. Being a Pisces, I have to honestly admit, I’m a damn hell of a dreamer, or imaginer, whatever you call it. Whenever I’m alone and have nothing to do on hand, I’ll think about tons of random things, day-dream about weird scenarios, wondering about the what-ifs… Maybe that’s why when I have dreams, my dreams are either ridiculous or weird or nonsensical or, to put it simply, can never happen in reality. 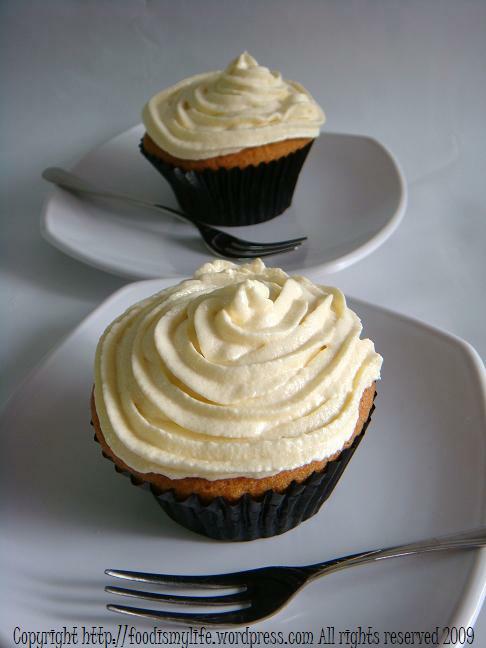 Do you like cakes more… or cupcakes more? Take your pick! When I read the recipe last night on The Pioneer Woman, I know I have to make this, and nothing’s gonna stop me. Pioneer Woman is amazing and I absolutely love her, and her blog. She always posts step-by-step photos, and none of the photos are not tempting. All the food are simply screaming out, “Pick me, pick me! Pick me to cook next!” Just reading her blog will make my tummy rumble. My poor tummy. Getting hungry and fat getting fat. 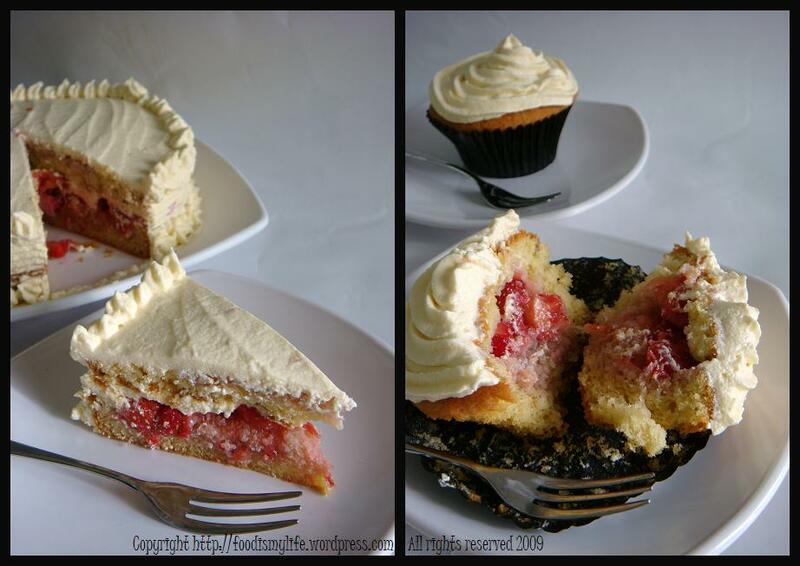 This recipe is a plain vanilla sponge cake filled with macerated strawberries and iced with a cream cheese-butter icing. I have to admit, this recipe is definitely fattening, unless you leave the icing out. But hey, what joy is there when a cupcake has no icing? It will be so bald and lonely, isn’t it? When it comes to the sweetness level, I cut both the sugar content in the cake and in the icing. I just couldn’t bear to add 1 and 1/2 pounds (672 grams) of icing sugar into the icing. I guess that’s why my icing isn’t as white in colour as that of Pioneer Woman’s. That aside, the cake is fantastically good. 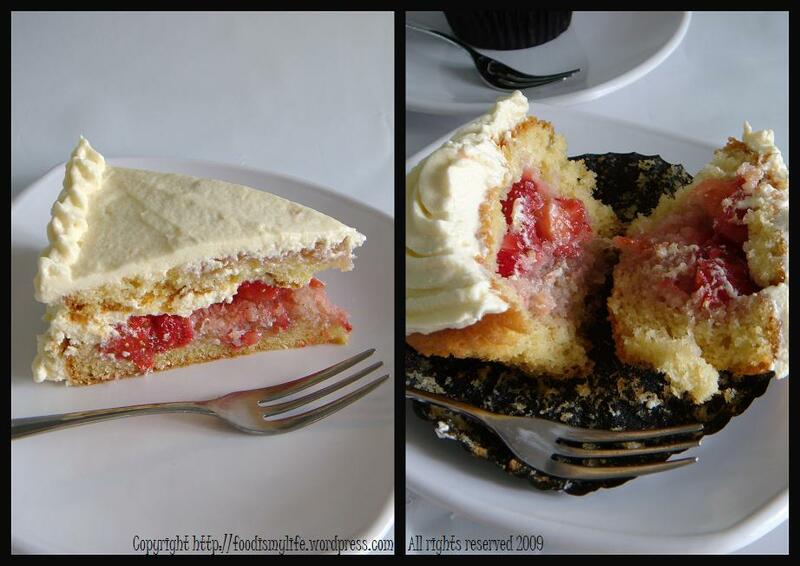 The light and fluffy cake, the syrupy strawberries, the heavenly icing… everything. For the cupcakes, instead of halving them to sandwich the strawberries, I dug a small little hole and filled it with the macerated strawberries, before covering with a little bit of cake and then the icing. It’s like a surprise cupcake. I will say that you must must make this cake if you’re a strawberry lover like me. If you like it cute, go for the cupcakes, but otherwise, go for the cake. I’m sure nobody will mind 😉 And I guess it will taste even better on the second day when the cake absorbed the syrupy goodness of the strawberries. Head over to the Pioneer Woman for all the other fantastic (and better) photos. Sift together flour, salt, baking soda, and corn starch. Cream 9 tablespoons butter with the sugar until light and fluffy. Add eggs one at a time, mixing well each time. Add sour cream and vanilla and mix until combined. Add sifted dry ingredients and mix on low speed until just barely combined. Pour into greased and floured 8-inch cake pan. Bake at 175 degrees Celsius for 45 to 50 minutes, or until no longer jiggly like my bottom. Remove from cake pan as soon as you pull it out of the oven, and place on a cooling rack and allow it to cool completely. NOTE: the cake tends to get pretty golden brown on the outside when it bakes…but it’s perfect inside. Stem strawberries and slice them in half from bottom to top. Place into a bowl and sprinkle with 3 tablespoons sugar. Stir together and let sit for 30 minutes. After 30 minutes, mash the strawberries in two batches. Sprinkle each half with 1 tablespoons sugar and allow to sit for another 30 minutes. Make icing: combine cream cheese, 2 sticks butter, sifted powdered sugar, vanilla, and dash of salt in a mixing bowl. Mix until very light and fluffy. Slice cake in half through the middle. Spread strawberries evenly over each half (cut side up), pouring on all the juices. Place cake halves into the freezer for five minutes, just to make icing easier. Remove from freezer. Use a little less than 1/3 of the icing to spread over the top of the strawberries on the bottom layer. Place the second layer on top. 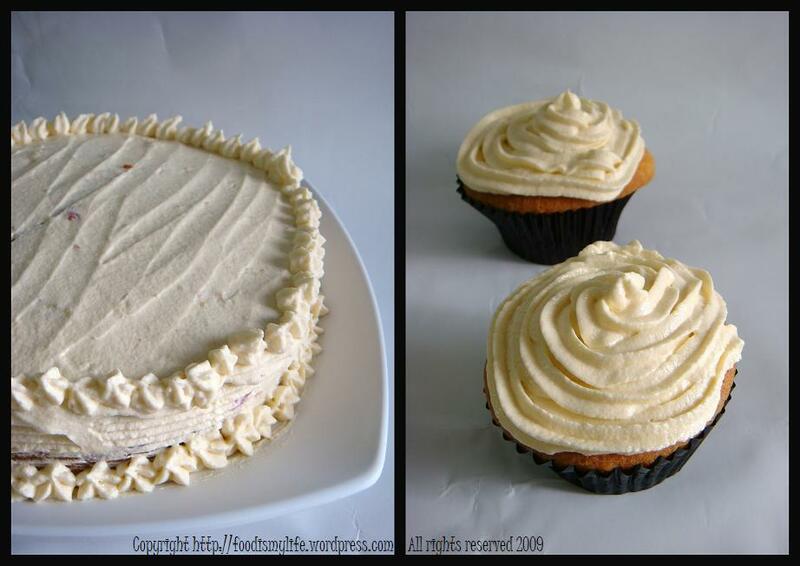 Add half of the remaining icing to the top spreading evenly, then spread the remaining 1/3 cup around the sides. Leave plain OR garnish with strawberry halves. IMPORTANT: Cake is best when served slightly cool. 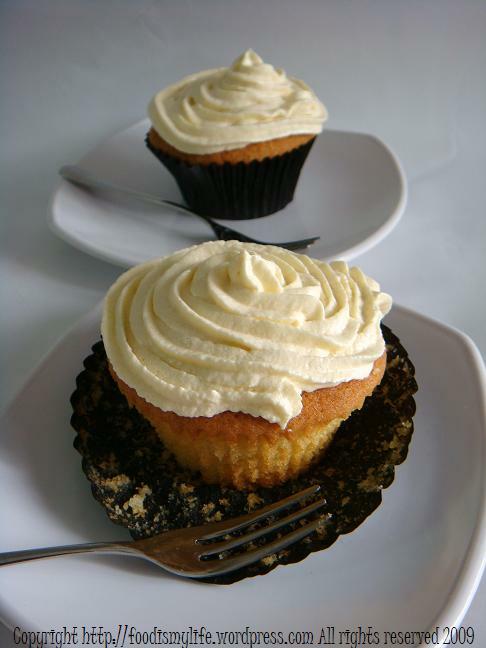 The butter content in the icing will cause it to soften at room temperature. For best results, store in the fridge!